The gemstone globe traffic circle in Idar. Fancy Stone & Jeweler City sign. 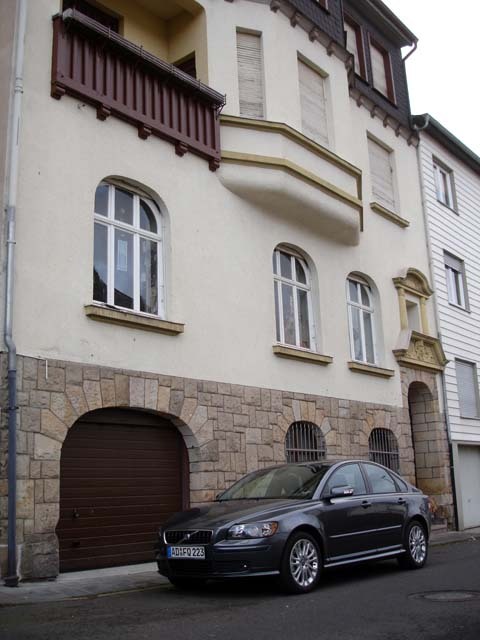 Idar-Oberstein held a special interest for me when I lived at Strassburg Kaserne in Algenrodt for six short weeks in 2005. So, after returning from Iraq in November 2006, I looked for apartments in this area. In fact, if I had not chosen this apartment, I would not have met my wife, Hanne. Her brother Klaus lived next door, and introduced me to her. 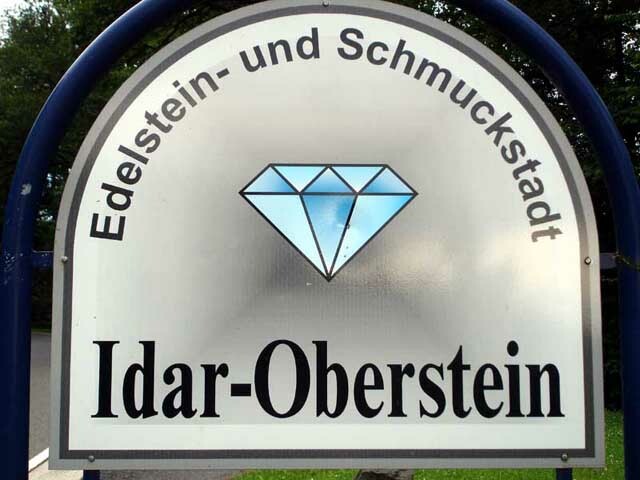 Idar-Oberstein is actually a combination of the names of the two cities of Idar and Oberstein. The center for Europe's gem and stone industry grew here, and can still be seen today. And, as such, people from all over the world live and work here. Hanne and I toured the Steinkaulenberg mines, which are located in Algenrodt, on the mountain just above Idar. .
To get an idea of the layout of Idar, I've provided a map below, which has areas of interest marked, as well as some places that I have added. 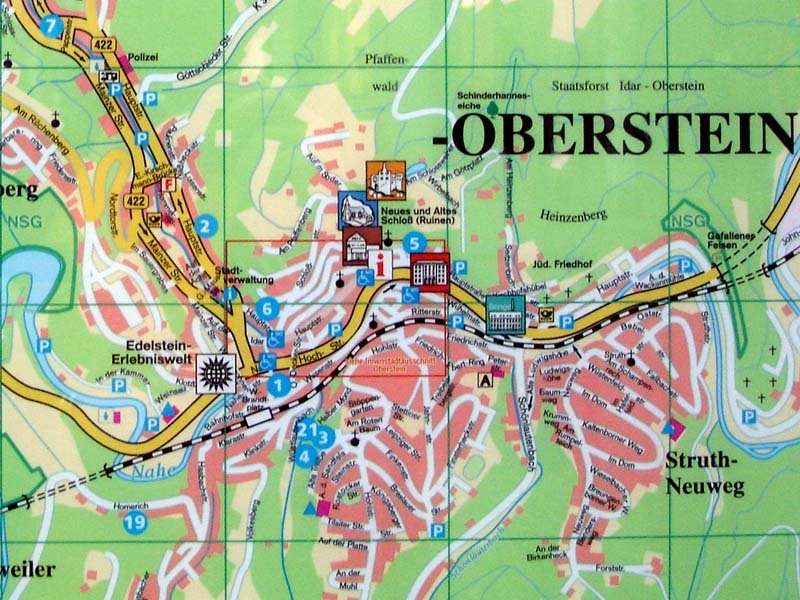 A map of Oberstein can be found here Map of Oberstein, and continues from the southeast corner of the Idar map. 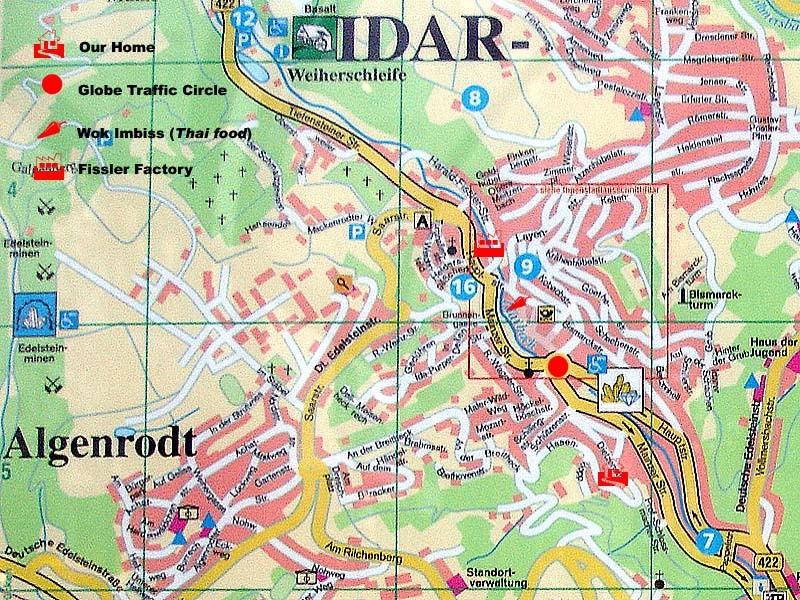 Some of the places in Idar where Hanne and I enjoyed eating are The Brasserie, the Serhat Grill, the Venezia Eis Cafe, and especially the Wok Imbiss which specializes in Thai food. Since Hanne and I like to walk, we sometimes walked out to the Weiherschleife, which is just north of Idar in the town of Tiefenstein. 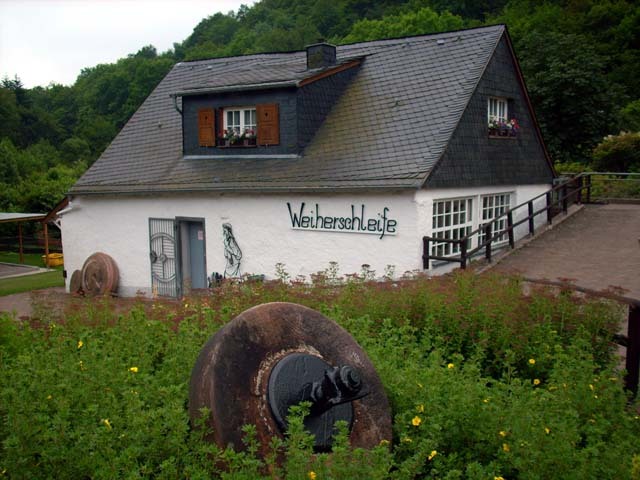 This is the only remaining operating schleife that can be found in the area, and has been turned into a museum. It was here, where Hanne's grandfather earned a living by enduring the arduous work of lying on his belly for hours at a time grinding gemstones on large wheels powered by the water of the Idarbach (Idar creek). An object that could seen on the hilltop across from our home, is the Bismarck Turm. It was built in 1907 as a memorial to Chancellor Otto von Bismarck. This is just one of over 200 towers built all over the world in honor of this historical cult-figure. 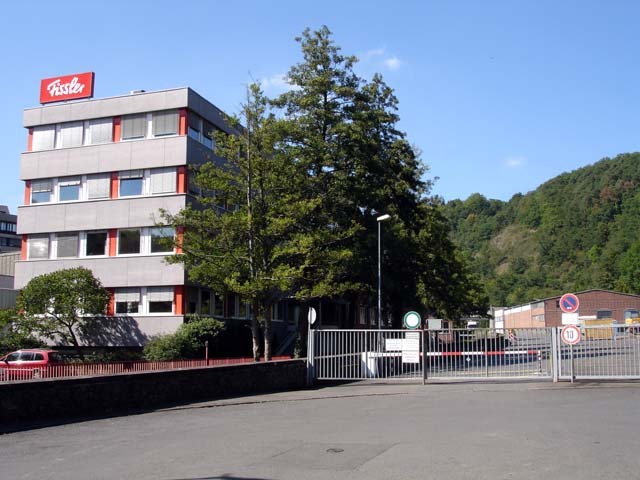 Also located in Idar, is the Fissler factory, which makes premium cookware. The Fissler company was founded in Idar in 1845, and has been a major employer in the area. My brother-in-law, Reiner, gave me a Fissler pressure-cooker before we moved to Oklahoma. Now, every time I cook with it, I'll be reminded of my hometown in Germany. The Felsenkirche, or "Cliff Church", is probably the most well recognized landmark of Oberstein. This 500 year-old church was built into the side of the cliff, over-looking the city. The ruins of Schloss Oberstein can been seen located almost directly above the church. 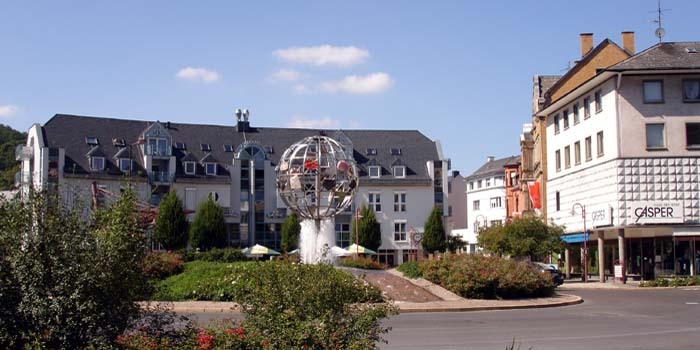 The center of historic Oberstein is a great place for tourist shopping, and even a nice place for locals to go on a lazy afternoon. It may have been modernized a bit, but some of that "Old World" feeling still remains.